Taking down all of the Christmas red is always a little sad and can make the house seem as cold as the air outside. While I was shopping the after Christmas sales this year, I kept finding red decorations that would be just as cute for Valentine's Day. Because I'm planning a Valentine's Day first birthday party, I've started to get the house ready and I'm loving having bright red all over the house again. So if the house is feeling a little blah after taking down the Christmas glitz, just do what I'm doing and throw some hearts all over it! I used red felt hearts to trim the same white spray painted branch I use all of the time and instantly brightened and warmed up the foyer. Love it. I'm still deciding whether to keep it in the entry or use somewhere else at the party so more pictures to follow! One of the best bargains I found after Christmas was a stack of wild looking sparkly floral accents. They were 90% off because they were a holiday item so each stem was about 30 cents. Even if they end up being a tad sparkly at Christmas, for a Valentine's Day party centerpiece or mantel, I love them. I'm having so much fun planning a Valentine's Day party as crazy and a little sad as it is to me how fast this first birthday has arrived. There are a lot of hearts flying around here and I'm loving it. Love it! 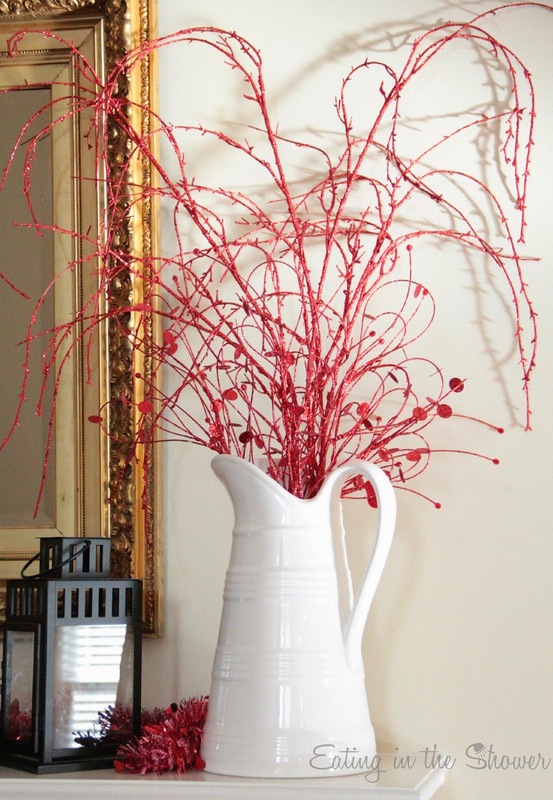 Pretty little lantern & I love the sprayed branches & pitcher! I think my favorite is your white branch. How creative and fun! I love pieces like that that you can reuse over and over for new projects! Love the white tree. And I'm also missing the colors of Christmas, so the red is great! Oh this is REALLY cute! 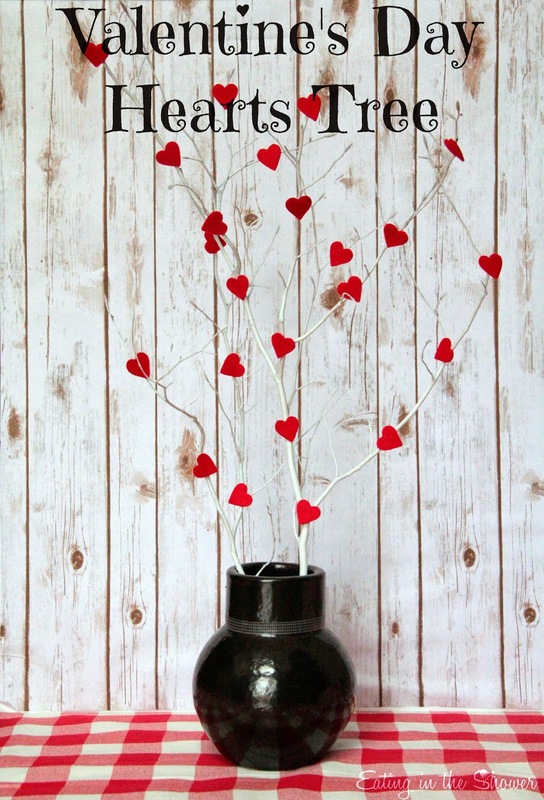 I love the white branch and the hearts!